Charlotte County Habitat for Humanity ReSale Stores provide necessary revenue for our homeownership program. Our stores offer gently used merchandise at a great price. Volunteers are always busy with various tasks. 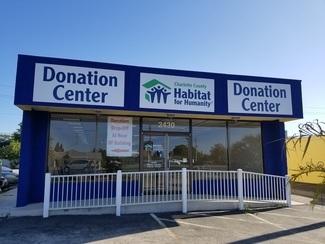 Some of the things you may do if you volunteer at the Donation Center is: sort and process merchandise, accept donations, prepare merchandise to be transported to other stores, test electrical merchandise or answer phones. You can sign up for a four hour shift or stay for the entire day! Volunteers have helped Charlotte County Habitat provide more than 425 families achieve the American Dream of Homeownerhip.